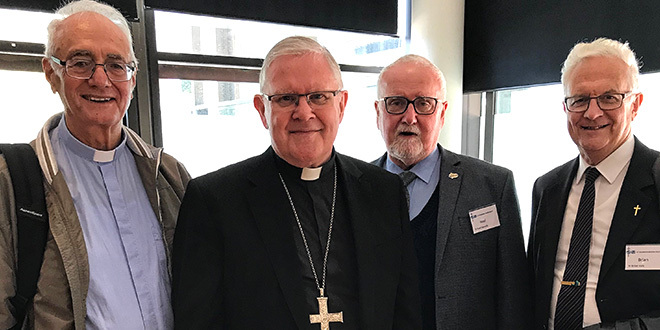 Columbans celebrate: Brisbane Archbishop Mark Coleridge (centre) is with (from left) Columban Fathers Warren Kinne, Noel Connolly and Brian Vale. THE Columban Fathers’ mission of spreading the Gospel message across the world has been honoured at a Mass to celebrate the order’s centenary. The Mass of Thanksgiving at Brisbane’s St Stephen’s Cathedral last Sunday celebrated the Missionary Society of St Columban evangelising the world. They can be found in Ireland, Britain, Fiji, Taiwan, Japan, Philippines, Korea, China, Myanmar, Pakistan, Chile, Peru, Australia, New Zealand and the United States. “We started in China but have networked in many countries,” Fr Warren Kinne, 72, who was born and bred in Bundaberg and spent two decades as a missionary priest in China, said. After years of testing the boundaries of communist authority and control in China, Fr Kinne said he believed last month’s landmark deal between China and the Holy See was a pivotal step forward for the Church. “For the first time probably in Chinese history you have the recognition that the pope is the head of the Catholic Church and appoints bishops everywhere including in China,” he said. Under the deal Pope Francis has admitted Communist Party-appointed bishops, previously excommunicated, into the papal fold, while Beijing agreed to recognise some of the underground bishops in China who had been ordained by the Church. “It’s quite an achievement. Of course how the fallout works long term remains to be seen. It might take a long time to know that,” Fr Kinne said. Fr Kinne is working as a chaplain at Griffith University’s Gold Coast campus and regularly celebrates Mass in the Surfers Paradise parish.